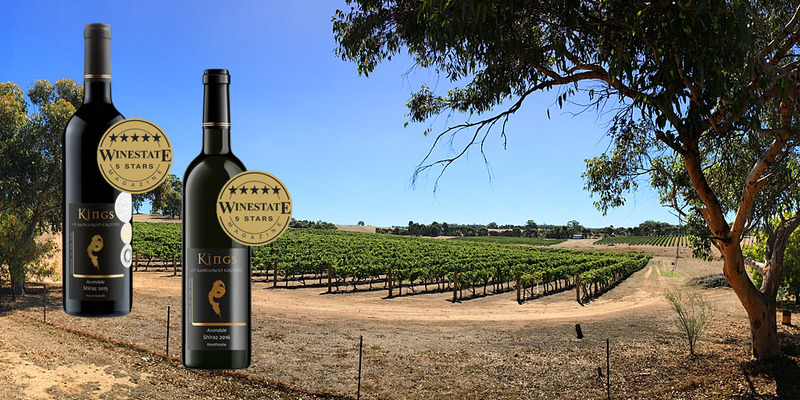 We are pretty ecstatic to announce that Winestate Magazine have awarded two of our wines 5 Stars in their Central and Western Victoria tasting, March/April edition 2019. Both our 2015 Avondale Shiraz and 2016 Avondale Shiraz received a 5 Star award and were the top wine in their respective category. Both these wines are made by Kings of Kangaroo Ground using fruit from the Coliban Glen vineyard in Heathcote, and we are pleased to acknowledge our grower Peter Raeburn to share in this accolade (that’s Peter’s vineyard in the picture). Both of these wines are available now at Cellar Door or through our Web shop (click Shop above). Or drop into Cellar Door any Saturday 10am – 3pm for a taste of these wines. And by the way if your are on Instagram or Facebook, keep an eye out over the next week or so for a competition where you may be in with a shot at winning a bottle of each wine.